It's a bizarre case that's sure to make your eyes feel itchy. When a Taiwanese woman's eye was swollen and she went to the hospital to figure out what was wrong, she thought it might be an infection but never could've imagined what doctors would discover. A doctor wound up finding four small sweat bees inside the woman's eye, CTS News reported. The woman, identified as Ms. He, told reporters at a news conference in Taiwan that it had felt like "a very intense stinging pain" and she had constantly been shedding tears before seeing a doctor. Dr. Hong Chi Ting told the BBC he was "shocked" when he used a microscope to examine her eye and saw insect legs coming from one of her eye sockets. The Fooyin University Hospital doctor then removed four of the approximately 4mm insects from the woman's left eyelid. But how did four sweat bees wind up inside the woman's eye? According to The Washington Post, He told reporters she suspects it happened the day before the startling bee discovery. She was "visiting and tidying a relative's grave" and doing some weeding as part of the Qingming Festival, also known as Tomb Sweeping Day, and felt something get in her eye. The BBC noted that the woman assumed it was dirt in her eye, but hours later she decided to see a doctor when her eye was still swollen and in pain. Thankfully, Ms. He didn't rub her eyes a lot before seeking help. Otherwise, doctors fear she could've gone blind. "She was wearing contact lenses so she didn't dare to rub her eyes in case she broke the lens. If she did she could have induced the bees to produce venom... she could have gone blind," Dr. Hong said, according to the BBC. He added that the bees were still alive when they were removed and have been sent to another organization to be studied. He said it's the first time in Taiwan they've seen anything like this. 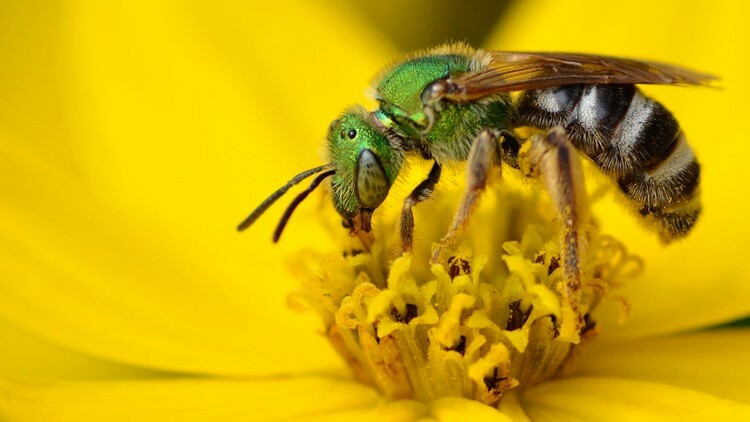 According to the Missouri Department of Conservation, sweat bees aren't aggressive but are attracted to perspiration and sometimes land on humans to get moisture and salts from their sweat. A The Metallic Green Sweat Bee feeds on a Tickseed Flower.